This week’s kitchen vocabulary word is batter. 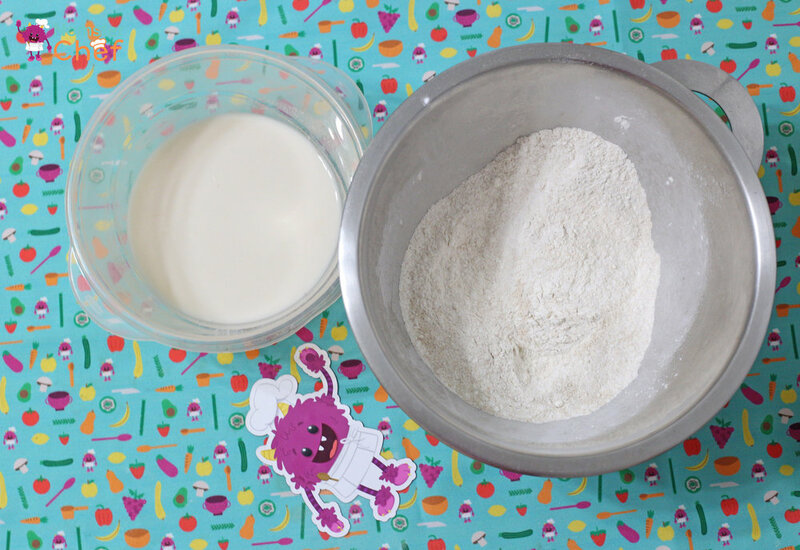 Batter is a semiliquid mixture usually made with flour, eggs and milk. These vegan pancakes don’t have milk or eggs, instead, vegan pancakes use other cooking materials in their recipe. This week we will be working with dry and wet batters to make these delicious vegan pancakes! First, we will start with the wet ingredients. First, add 2 cups of almond milk. Next, add 2 Tablespoons of apple cider vinegar. Add 2 teaspoons of vanilla. Let the wet mixture sit for 5-7 minutes. Tip: Wet and dry ingredients should always be mixed in two different bowls. Wet ingredients will be added to the dry mixture. Keeping the wet and dry parts of the batter separate until the end will make your batter smoother. Now the dry ingredients! Get your other medium bowl and add 1 cup of whole wheat flour and 1 cup of white flour. Add 2 Tablespoons of sugar and 2 Tablespoons of baking powder. Add ½ teaspoon of salt. Whisk the dry batter to combine all of the ingredients. Pour the wet batter into the dry batter and stir thoroughly. After 5 minutes, get out your baking sheet and cover with parchment paper. Use the spoon to spread the batter evenly across the parchment paper. Next, add strawberries, blueberries and blackberries on top of the batter. Kid chef, set the timer to 15 minutes. ** Grown up ** Place the baking sheet into the oven and remove once the timer is up. Optional: top with whipped cream (dairy eaters) or powdered sugar.